The band are playing an hour-long gig in front of an assembled audience in March. 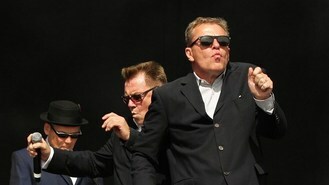 Madness said: "We've played at some exciting places in London lately but the closing of BBC TV Centre... that is close to our hearts. "As a band we grew up there, those walls have plenty of Madness tales to tell, a sad day... but what a celebration! We're honoured to be the band the Beeb have chosen for this fond farewell." BBC Four Controller Richard Klein said: "I can think of no better band than Madness to help celebrate a golden age of television coming out of the BBC's Television Centre." The concert will lead into a two-hour pre-recorded special, Goodbye TV Centre, in which former BBC Chairman Michael Grade will interview the likes of Penelope Keith, Sir Michael Parkinson and Ronnie Corbett. TV Centre opened its doors in 1960 and has been sold to developers for £200 million. Among the shows recorded in its studios are Fawlty Towers, Monty Python's Flying Circus, Blue Peter, Doctor Who and Strictly Come Dancing.